Cindy Prascik's Review of Shazam! Yesterday's Flashback Cinema presentation of the Blues Brothers afforded me the opportunity to pair it with a catch-up screening of a newer release. For better or worse, I opted for Shazam. A streetwise foster kid learns to deal with his unwittingly-obtained super powers. Alright, friends and fans, the usual disclaimer: I'm a DC girl. Even when other people think DC is bad, I usually think it's good. While I'm sure Shazam is somebody, somewhere's favorite, to me he's kind of a second-rate hero, and it's doubtful I'd have bothered with this movie at all if it had been Marvel. Having said that, Shazam does have some positives, so let's start with those. Shazam's cast is pretty likable. Outside of the extraordinary Mark Strong, there isn't anyone who would have drawn me to the cinema sans additional motivation, but, together, they're a solid unit. The two lead kids, Asher Angel and Jack Dylan Grazer, work especially well together and are quite engaging. While some green screen work is on the dicey side, the creature effects look good. The story is cute and amusing, though the movie takes longer than it should to tell it. Set during the Christmas holidays, there's a fair bit of cheery decor and even a holiday tune or two, which gives most any film a head-start towards my good graces. Sadly, Shazam has its share of negatives as well. As mentioned, it is too long and very, very sluggish at times. While the Aquaman movie successfully turned one of comics' sillier heroes into a badass, Shazam unfortunately wallows in its ridiculousness, ostensibly for hilarity, but...well...it's really not that hilarious. 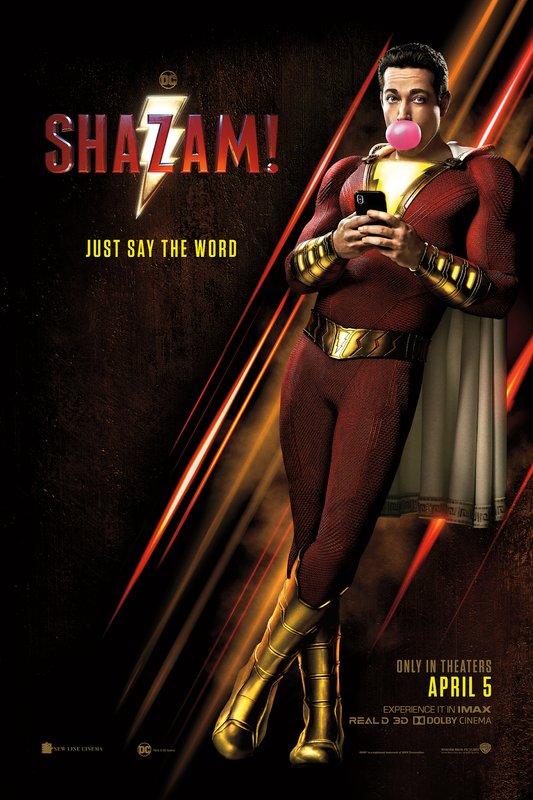 As a DC fan, I cannot stand DC trying to be more Marvel, and Shazam suffers almost terminally from two of Marvel's worst defects: First, it attempts to shoe-horn humor into every possible niche, whether or not it suits the moment or is actually funny. The Iron Man "joke at least every third line" model barely works for Iron Man, nevermind for anyone else. Secondly, the film incessantly name-drops better-known (or just better) heroes. When filmmakers do this, at best, I hope they're trying to provide a level of connectivity among their universes; at worst I think they're just hoping fans' goodwill might transfer to the less-loved property. Usually it just reminds me there are other heroes with better stories I'd rather be watching. Ultimately, much like DC's Black Lightning TV series, I found the foster-family story in Shazam far more interesting than anything to do with super-powers. That would be great if it provided depth that made the movie more than "just" a super-hero film (as it does for Black Lightning), but in this case it only accents how unremarkable the rest is. Shazam clocks in at 132 minutes and is rated PG13 for "intense sequences of action, language, and suggestive material." Shazam is nothing special, but if your expectations aren't too high, you might spend a mostly-enjoyable couple hours with it. Of a possible nine Weasleys, Shazam gets five. Fangirl points: In addition to the aforementioned Christmas tunes, one scene features Warrant's Cherry Pie in the background, plus Ramones over the end credits! And...uh...did I mention Mark Strong?? 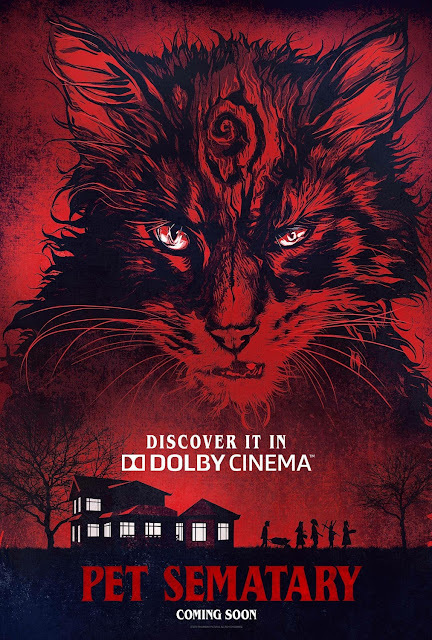 The second adaptation of Stephen King’s Pet Sematary is much like its first adaptation, a mix bag of jump scares and under explored ideas. I can’t speak to how closely the film follows the original novel since it’s one of King’s major works I never got around to reading. As such, the film offers little in the way of tension or surprises. There are a well timed jump scares which directors Kevin Kolsch and Dennis Widmyer choreograph well but never feel particularly fresh. It’s a theme that carries throughout the majority of film even thought it’s propped up by a strong central performance by Jason Clarke. Jeté Laurence, likewise, makes an impressive debut as the pair’s daughter and John Lithgow is equally strong in a supporting role but the story never bothers to delve any deeper into the various themes at play. Instead we’re left questioning the bevy of terrible decisions the central characters make but the film never really bother making you care much about them so when things start going bad we don’t get the desired dread. Instead we’re left with general disinterest over another forgettable horror film. 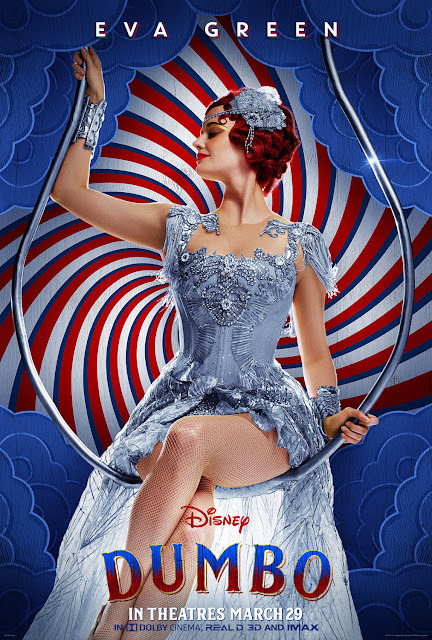 Dumbo, the latest live action money grab from Disney, is a film that’s visually lush but fairly sterile and bland. Tim Burton seems like a solid fit for this retelling of this tale of an outsider, something Burton excels at. The odd thing is that it’s a visually impressive film but it fails to connect on an emotional level consistently. The CGI creation that is Dumbo is impressive but it’s difficult to connect to the character since it doesn’t talk like in the original film. Going for a more grounded approach is a bit of a misstep since you’re supposed to connect with your lead character in order for the whole thing to work. To compound the issue, Tim Burton seems far more focused on the visuals of the film than the performances of his A list cast. As a result we get some fairly stilted performances that come off as overly broad and soulless which is just startling considering the fact that you have such a strong and likable cast. They each manage to shine in spots but it never comes together to create a cohesive story since their characters are so thinly written. As a result, this live action redux feels fairly unnecessary and uninspired.